You can execute a NeoLoad scenario in an existing TeamCity job. 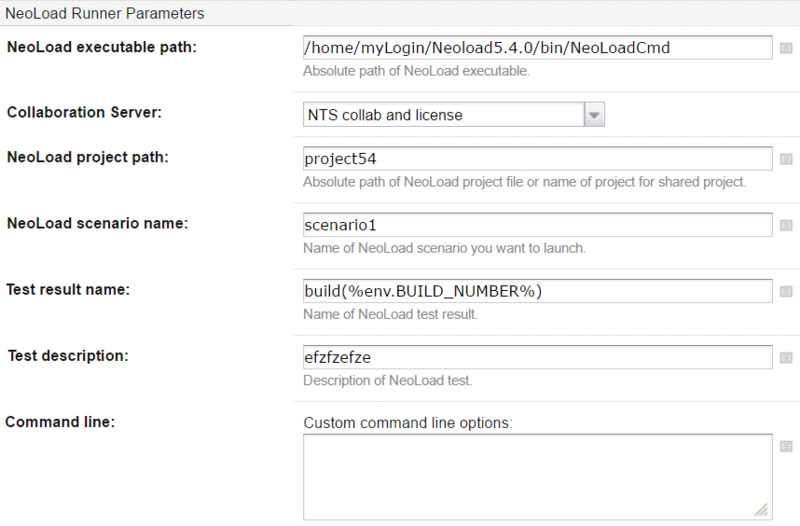 Select the project where you want to execute a NeoLoad scenario. Select the job where you want to execute a NeoLoad scenario. In the Build Steps section, click Add build step and select NeoLoad. In the newly created step, enter the information required to execute the NeoLoad scenario. Warning: If you have configured several NTS, make sure you use the same NTS configuration if you are using NTS to manage license and project collaboration within the same job. If NeoLoad is deployed on the agents as a Tool, use the variable teamcity.tool.<NeoLoad installed tool id>. For example, if NeoLoad has been installed as a zip archive named "neoload.zip" as explained in Recommendations, the variable to use is %teamcity.tool.neoload%/bin/NeoLoadCmd. If NeoLoad is installed on an agent, use the absolute path of the NeoLoad installation. If the project is located on the hard drive, select "The project is on Hard Drive" and enter the absolute path of the NeoLoad project file in the NeoLoad project path field. If the project is shared, select the NTS configuration and enter the name of the project in the NeoLoad project path field. NTS Server: select the NTS configuration you want to use to lease a license. Number of VUs: enter the number of Virtual Users you want to use for your test.